Kristian Rouz — The Fed is poised to introduce more stress tests for commercial lenders in order to prevent future crises as the real estate sector is experiencing a massive surge in prices. While the Fed is likely to undertake a total of three interest rates hikes this year (which means one more raise by year end), and four more times in 2018, a recession might be a possibility as soon as sometime next year, as economic reform in the US might lag behind the development of the threats to economic stability. Stanley Fischer, the Federal Reserve's Board Vice Chair, said that, although the US financial system is significantly more resilient in the face of economic shocks now than it was ten years ago, the central bank will take steps to fortify commercial lender sustainability in order to stave off possible risks. "The core of the financial system is much stronger, the worst lending practices have been curtailed, and much progress has been made in processes to reduce unnecessary foreclosures," Fischer said. However, as real estate prices are on the rise and many US consumers are struggling amid high leverage and underperforming growth in salaries and wages, the housing sector and the US debt market might present significant risks to economic stability, especially when the Trump administration is in the middle of structural economic reforms. President Donald Trump's agenda includes a deregulation of the banking sector, aimed at spurring lending and investment. In such a situation, the Fed's mission is to ensure the commercial lenders are sustainable, have enough capital to cover possible losses, and are efficient enough to withstand the ongoing creeping increase in debt delinquencies and other non-performing loan (NPL)-related issues. "There is more to be done, and much improvement to be preserved and built on, for the world as we know it cannot afford another pair of crises of the magnitude of the Great Recession and the Global Financial Crisis," Fischer said. The Fed policies, along with the continued tightening cycle, will include an implementation of measures which would allow for the prevention and the avoidance of mortgage foreclosures, making the lives of both banks and consumers easier. In the meantime, while the White House prepares to implement a set of fiscal policies aimed at boosting growth, the Fed remains committed to raise base borrowing costs further in order to both stave off the threat of assets bubbles forming in various sectors of the US economy, and also boost the profitability of loan issuance. The Trump administration, for its part, seeks to cut taxes, boost infrastructure spending and deregulate the economy in order to boost wages, Main Street investment, and construction starts. In doing so the administration plans to contribute to the increased purchasing power of US consumers and a higher output across many sectors of the US economy. The latter would allow, among other things, for the curbing of sky-high real estate prices. Still, the US economy is likely to experience a recession in the coming 3-5 years, according to the observations of the Newport Beach, CA-based Pacific Investment Management Company (PIMCO), as existing structural challenges will require very tightly coordinated measures on both the monetary policy and fiscal policy sides. "They (the US Fed) may go (hike rates) again this year, they could go… four times next year depending on what we get on fiscal policy," Andrew Balls of PIMCO said. "The probability of a recession over the next 3-5 years is pretty high." 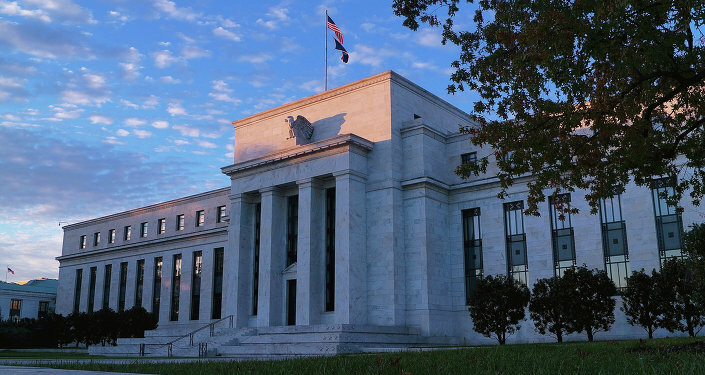 The Federal Reserve might be seeking to hike rates regardless of the macroeconomic situation, as evidenced by their recent hike this month, which happened against the backdrop of weaker macro data. Policy considerations require a stricter stance on the monetary side, as the impending fiscal stimulus in a low-rate environment could create asset bubbles, bringing a crisis closer. At the same time, excessive monetary tightening without proportional fiscal stimulus would strangulate the already weak US economic expansion. US base borrowing costs are now set within the gauge of 1.00-1.25 percent, and are poised to go up to 2.50 by early 2019, meaning the period between mid-2017 and mid-2018 will be momentous for the fiscal stimulus to come into effect.